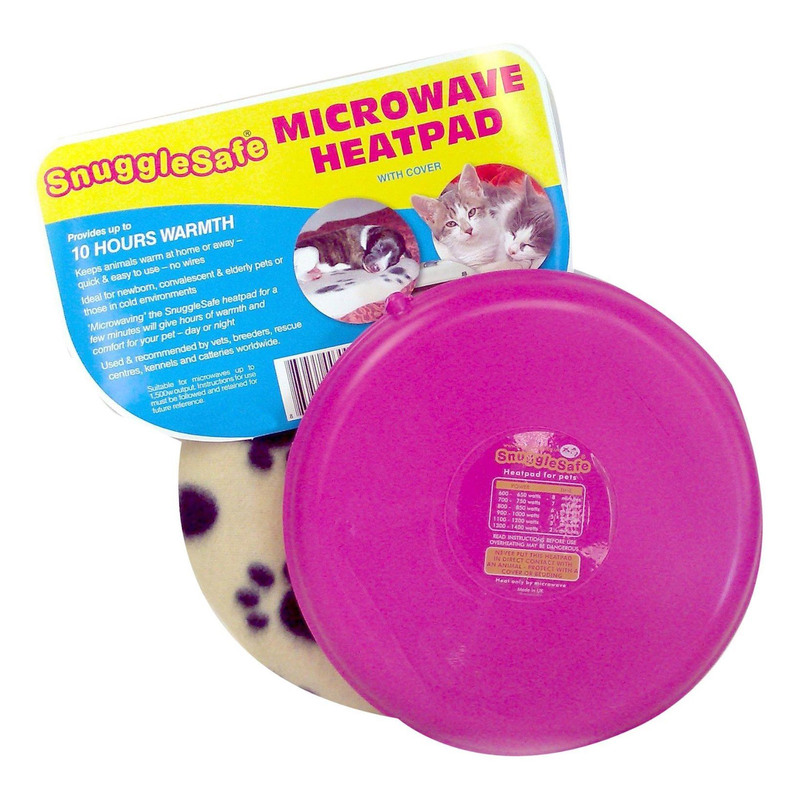 Snugglesafe Microwave Heatpad is a highly effective device to keep the pet warm while at home or away. The wireless heating device is used to generate warmth and therapeutic heat for ageing and arthritic pets. The device that gets activated by heating in a microwave oven provides 10 hours of warmth. Easy to carry, this non-toxic, environment friendly heat pad works well even when you are travelling with the pet. Snugglesafe Microwave Heatpad proves to be an ideal passive heat source for heating up beds and blankets of pets. It turns up as a much-needed help for nursing ailments and joint disorders in senior and arthritic pets. Once heated, SnuggleSafe releases heat continuously, is stabilised at 120° F after 3 hours. The temperature remains constant for 5 hours and then cools down gradually. It comes in the form of a bite resistant plastic disc with 8 1/2 inch diameter and 1-inch thickness. Easy to carry, the heat pad is accompanied by a removable polyester fleece cover, which is washable. Heating time may vary in accordance with the power of the microwave. Remove the cover; place the SnuggleSafe on the microwave turntable. Check the table below to know the exact heating time. If your microwave does not have turntable then flip the SnuggleSafe after heating one side for half time. Once the time cycle is finished, leave the SnuggleSafe in the switched off oven for a minute. During this time, the temperature of the heat pad will stabilize. Use a cloth or cover to remove it from the oven. Check if it is not overheated. Now, place it under the pet’s bed or lose blanket. If it is inside the cover than it is not necessary to place it under the bed but ensure that, the pet’s body does not touch the heated surface directly. Place good insulation under Snugglesafe to prevent heat loss downwards. Do not keep it in direct contact with the pet’s body. Do not use with animals that are unconscious or unable to react to thermal discomfort. I rescued 2 kitties that were only 3 weeks old and we have to travel by car a few hours every weekend so this warmer was perfect to keep them warm. Before winter get this pad for your aging pet if you have any. I have tried this on Tramp and it provides great comfort to him. He rarely cries now due to pain while getting up. and best is at Vetsupply. Quite comfortable for your aging dog. As my dog was suffering due to joint pain, my vet suggested to have this one. However, it is too pricey but i found vetsupply and bought at huge discount. Thanks vetsupply as my dog is little relieved from pain.